This time last spring, we planted 48 strawberry seedlings that were no taller than my thumb. We were told by the friendly older Amish man who sold them to us that we should pinch off the blossoms that first season so that the plants would put more energy into their leaves. This would make for a bumper crop next season (now). We did what we were told. That man surely knew what he was talking about because our strawberry bed is filled to the brim with berries. Annie wakes every morning and takes her wooden berry basket out for an early picking. We've been having berries for breakfast for the last week and we couldn't be happier. I think after the shell peas are done this season, I am going to plant another bed of strawberries for twice the fun next year. We have a friend who redesigns kitchens and he gave us a Sub Zero upright freezer (that someone no longer wanted because it was the wrong color for their new kitchen) for the cost of one homemade pie. Can you imagine? Me neither. We are now the proud owners of a new freezer which is already filling up with produce and other goodies. The aforementioned shell peas are growing like gangbusters. The girls have been picking them every day but most are going into their mouths rather than into the freezer. I did manage to put away a quart sized bag before they ate them all. The other night we sat on the porch, rocked and shelled peas together. I found a treasure at the antique show at our fairgrounds last weekend. Have you ever heard of a Mammy rocker? It is a two or three person rocking chair with a little gate behind which you can lay your baby/toddler and rock them to sleep. They were popular in the Civil War era and I have wanted one since I first became a mother. The gate is removable if two bigger people want to rock instead of rocking a baby. I outfitted it behind the gate with a little pillow and a woolen blanket for Mae to lay comfortably. When I found it at the antique show and saw how little they wanted for it, I welled up with tears which seems silly, I know. But the thought of being able to rock Mae to sleep on the porch on warm summer nights while singing her some lullabies really choked me up. I hope she has fond memories of that green Mammy rocker and her Mama shelling peas while she rocked off to sleep. Warm weather is coming our way here in Northeast Ohio so I am trying to finish my November Ruffle Wrap before the chill is out of the air. Right now the temperatures are in the mid fifties with an occasional jump into the sixties. When the summer months come, I tend to work on smaller projects that aren't quite so warm on my lap. I like the way the charcoal grey is speckled with the lighter weight alpaca. I think I will wear it alot on cold winter nights. I've been reading The Family Kitchen Garden and really love the way the projects are broken down on a month by month basis. We are in hardiness zone 6 which means I can follow the book as written without adjusting our growing calendar. Ben planted shell peas two weeks ago and they are beginning to sprout out back. The strawberries also have new leaves. We should have a bumper crop for jam and for eating. I plan to put in an herb garden on the west side of the house this spring and am looking for design ideas. I like circular gardens with small paths between plantings so I'm considering that idea. The Kid's Herb Book has a nice list of medicinal herbs and kitchen herbs that are child friendly plus some easy activities/recipes for children and parents to do together. I lost a hive of bees this winter. I heard a lot of people lost bees this year. I'm trying not to feel too badly about it and have ordered replacements to pick up the first week of May. My strong hive last year that subsequently survived this winter were Carnolians and the ones that died were Italians. So I ordered another colony of Carniolans. Here's hoping! In the meantime, I'm going to try to be more diligent to read the beekeeping books that are lying around my home and become a bit more educated in that regard. For those of you who keep bees, do you have a favorite go-to resource to answer your bee questions? You can find more Yarn Alongs at Ginny's. ~hope your summer is off to a fun and relaxing start! ...and toddlers who think the entire gardening process is delightful. She will be two next month. I can hardly believe it. Wants nothing to do with being called a big girl. "No! Big Baby!" I'm grateful for big boys who see the wonder and excitement in growing a garden. Ben had quite a nice garden of his own years ago and I'm so happy to see him tending this one just as lovingly. There is great healing in growing things and working with one's hands. He wakes up every morning and waters the beds faithfully. We have broccoli, cauliflower, bell peppers, hungarian wax peppers, banana peppers, spring lettuce, romaine, pickling cucumbers, tomatoes, celery and strawberries. When the early lettuce is finished, I will plant string beans. 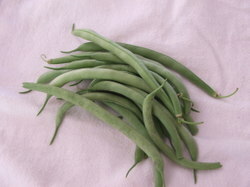 And wax beans. I so love wax beans. "Every child should have mud pies, grasshoppers, water-bugs, tadpoles, frogs, mud-turtles, elderberries, wild strawberries, acorns, chestnuts, trees to climb, brooks to wade in, water-lilies, woodchucks, bats, bees, butterflies, various animals to pet, hay-fields, pine-cones, rocks to roll, sand, snakes, huckleberries and hornets; and any child who has been deprived of these has been deprived of the best part of his education." There has been much time spent in the out of doors lately. We have taken a break from unpacking to work in the yard planting perennials, building and preparing vegetable gardens, hauling soil and readying bee boxes for their future inhabitants. The guys spent two days building the raised vegetable beds. They turned out so nicely. We have one 4x12 foot bed devoted to strawberries. The remaining 3 beds will be vegetables. 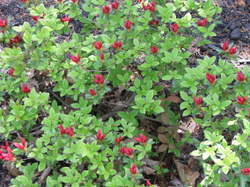 We also planted three blueberry bushes in the yard near the gardens. 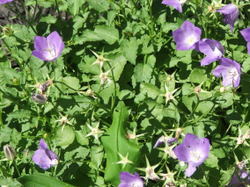 Above is one of the perennial beds that the children planted. It still needs to be mulched but they've done a fabulous job getting all of the flowers in the ground. As you can see, we are working on a little flagstone walkway as well. This perennial bed will be a cut flower garden to attract butterflies and hummingbirds. 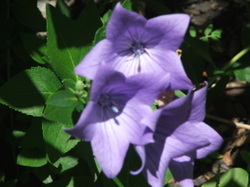 So far we have planted peonies, bleeding hearts (both white and pink), lupine, poppies, foxglove, daisies, coneflower, aster, pussytoes, clematis, columbine, black eyed susan, phlox, violets, lavender and veronica. There are also two rose bushes that were there when we moved in. The rest we have added ourselves. I'll take a photo of the bed when its completely finished. I added this little flower arrangement on the door at the end of the stone walkway. I will post some photos of the bee equipment, possibly tomorrow. Until then, I hope you have a happy day today and that you are able to get outside and enjoy the sunshine! I have always found it to be very therapeutic to dig in the dirt. I have a great love of gardening in general, whether it be perennial flowers, vegetables or little pots of pansies on the front porch. Yesterday, Christopher spent quite a while planting herbs in a divided basket. I used to have an herb garden at a previous home but the soil here is fairly shallow with a thick layer of shale beneath. There are a large number of tree roots to work around so we thought pots might be a better choice. Benjamin took care of planting several sweet basil plants in pots for me. I have a favorite recipe for basil pesto that I make quite often in the summertime. Mary chose a flower to plant that she could care for. We picked a sunny spot in the yard where she could watch it grow. She planted in memory of two goldfish pets that have died since we moved here. Seashell and Treasure Box's little grave that Mary made. Annie chose a Dahlia to plant. As I mentioned, the property is rocky so we have pots anywhere we can find a bit of sun. I kind of like the way the yard is beginning to look, kind of whimsical and colorful with little niches and growing spots. There is a beautiful, magical garden center/family farm nearby that has tiny flower fairies to put in the pots and little teeny dollhouse sized wheelbarrows and garden tools for only a couple of dollars. I may try to sneak over there on the sly and get a couple to put in the girls' pots to surprise them. I think they would like that. When we moved here eight years ago, we put in several large perennial beds. 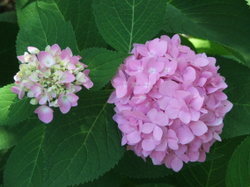 I have always loved hydrangeas and planted several different varieties. 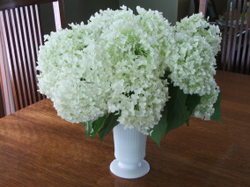 One of my favorites is the Annabelle hydrangea which produces creamy white snowball flowers. 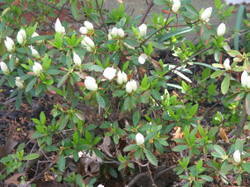 We have four such bushes throughout the yard. 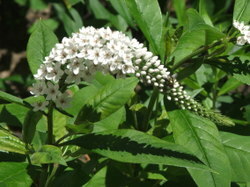 The blossoms turn a pale green as they age and keep their beauty into early fall. I think they look so pretty in a milk glass vase. When my father passed away a few years ago, two of Mike's aunts sent a gift of a Kousa Dogwood by which to remember him. 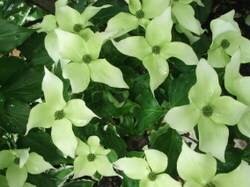 The Kousa Dogwood is sometimes called a Japanese Flowering Dogwood. 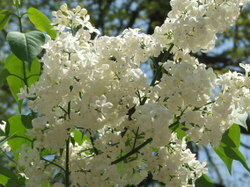 It is different from other dogwoods which blossom before getting their leaves. 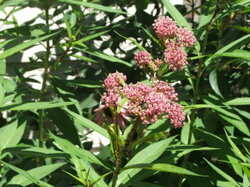 The Kousa blooms much later, well after the other dogwoods are finished blooming and after the tree has already grown its foliage. I thought you might enjoy seeing its pretty blossoms. 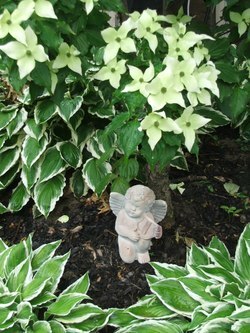 My friend Jackie had sent a little garden angel when we planted the tree and I placed it at the base of the trunk. I think the variegated green and white hosta look so nice next to this tree. Right now the dogwood is about twelve feet tall, though very thin. I understand they begin to branch out horizontally as they age. I hope to be able to sit in its shade someday when I am much older and watch the world go by. 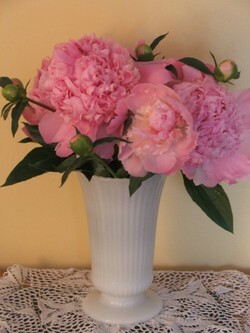 I am so happy that my peonies are blooming. Last week, I thrifted the milk glass vase and antique hand-knit doily. It always makes me smile when I find something for only a few cents that makes my home look more lovely. 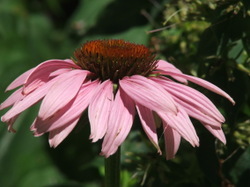 Two summers ago I was at a yard sale where the hostess was selling plants from her lovingly tended perennial gardens. 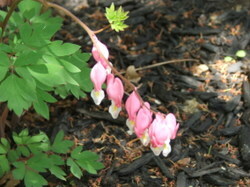 She had a single pink Lily of the Valley plant in a pot for sale. 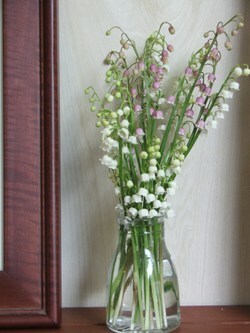 I had never heard of pink Lily of the Valley, much less seen one, so I purchased it on the spot. This year there were quite a few pink blossoms in amongst my grandmother's white. I thought you might enjoy seeing them. 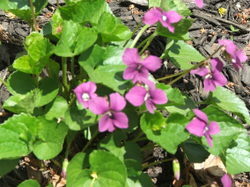 Our yard is growing in color with each passing day! 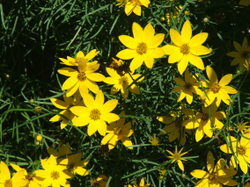 Here are some of the plants ready that have been blooming or are ready to burst into color. 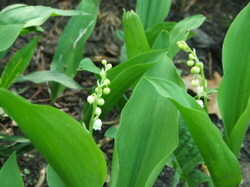 Lily of the Valley--almost ready! Should be open just in time for Mother's Day. The children always have such a fun time in the temporary pond that fills our backyard. A few times a year we get rain heavy enough to cause most of the backyard to be covered in water. Our soil is composed mostly of clay, as our backyard used to be a streambed, way back when. 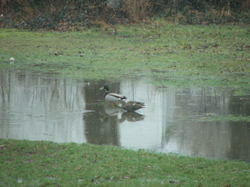 The other morning we awoke to find some new visitors in our yard, a mallard couple! I had hoped to get a better photo of them but they were a bit camera shy the first time I tried to take their picture so I kept my distance. Here are some other signs that Spring has arrived in Northeast Ohio. 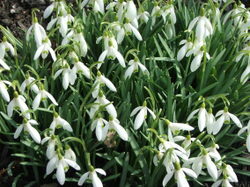 Snow Drops or as my little Grandma used to call them, Snow Peeps. 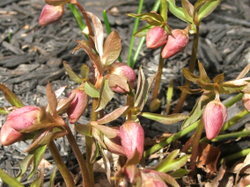 Speaking of my grandma, her Lenten Roses (or Hellebore) that are growing in my yard have begun to blossom! 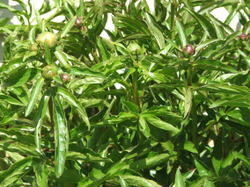 I am anxious to see the opened buds in the upcoming days. As a side note, I thought I had re-uploaded all of the photos from my previous blog to this one but a kind visitor reminded me that I am missing all the photos in my Nature Study category. I will try to upload them sometime this week. Thanks for noticing! I hope you have a wonderful, relaxing Sunday with your family. Unfortunately, I did not compile a post in time for Michele's Loveliness of Autumn fair. Please, do stop by to read the wonderful posts and ideas that are shared there! There are so many ways that we can make our homes welcoming with each season change. I really enjoy the change from Summer to Autumn, not only because the latter is my favorite season to be out of doors but because the changes within my home are the simplest for me as well. Our previous home, which was a rental, had gorgeous woodwork and leaded glass windows with built in china cabinets and window seats. We now live in a 1940's bungalow which has small rooms that do not have a whole lot of character. This home really relies on its decorating colors and furniture to make it interesting. I have painted most of the rooms in warm tones so Autumn decorations really work well here. This is the view into our front door. 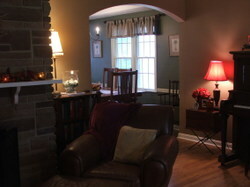 The wood burning fireplace gets a lot of use in the colder months. I try to decorate the mantel and the area above it for the season at hand. I purchased this wheat wreath from a small, family-owned company several years ago. I hang it from the beginning of Autumn until Advent. 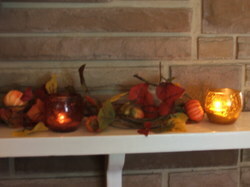 The mantel is decorated with some silk autumn leaves and small artificial pumpkins/gourds. These, I purchased at a Dollar Tree store. The entire mantel's decorations cost $5, excluding the candles which I bought many years ago. 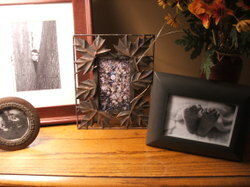 Some other ways to highlight the seasons are by using interesting photo frames around the house. I often purchase these after the season is over and they are much less expensive. Added to a table with some other photos, it gives a little touch of Autumn for a small amount of money. This one, of iron leaves, adds a little character to the table alongside the vase of fall flowers and foliage that I change each season. 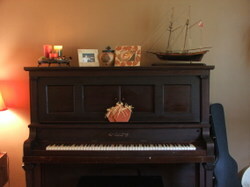 Also in the living room is the piano which just asks to be decorated! It is here that we place our Advent log during Advent, decorated with greens and berries. 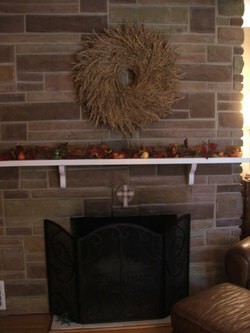 During the fall, we use fall candles, seasonal photo frames and other decorations to bring it to life. My dining room is our only eating area in the house. 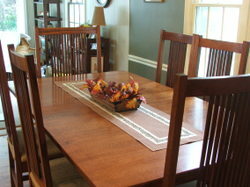 It is home to a table and six chairs. There is no room for anything else. 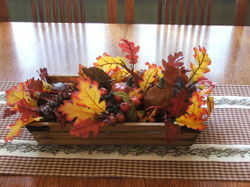 I keep the decorations simple in there, just a runner (also used at Christmastime) and small basket of leaves and gourds. Once again, the basket and gourds were less than $5 at the dollar store. 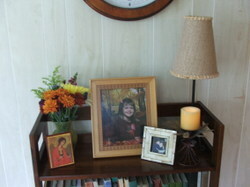 Here is a shelf in my little sunroom, which is joined to my dining room. My mother likes to bring fresh flowers for me now and then (which I really love! ) This time she brought mums to brighten my day. They really add a nice fall flair to the room. 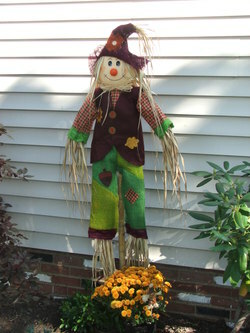 On the outside of our home, we have a couple of these fellows hanging around the mums and pumpkins. The littles really like them . When it is dark in the evening and I have come back from being out, I have been known to jump pretty high, thinking they are a real person by my door! Thanks for letting me share these few, simple ways that I have tried to bring Autumn to my home. Perhaps your home has a season that looks just right within its walls. My mother-in-love's home is a wonderful, festive place in the winter with all of its decorations for Christmas. For which season do you most enjoy decorating your home?